One of the major issues facing the Jewish community is Intermarriage. About 50% of Jewish people getting married today are marrying Gentiles. Inevitably, these marriages face issues about religion, cultural practices, and other things that can at best strain the relationship and at worst lead to divorce. This 24 page booklet will provide a biblical solution for these couples that will help them individually and as a family thrive and prosper in their spiritual lives. 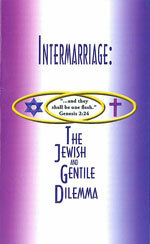 This booklet explains that the answer is not religion but relationship – with the God of Abraham, Isaac, and Jacob.